On February 19th-21st, the Center for Public Health Quality hosted its second PH QI 101 workshop for Wave 7 participants. 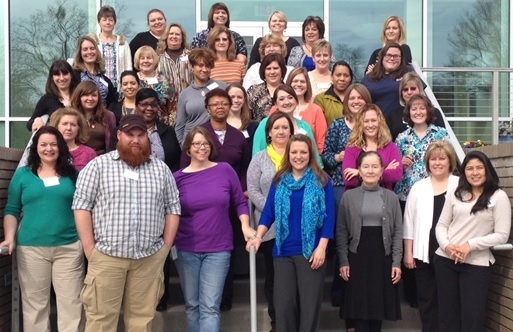 This workshop was the final phase in the PH QI 101 program for the eight local health departments in this cohort. This workshop focused on sharing lessons each team learned on their initial leg of their QI journey, celebrating achievements, gaining a deeper understanding of QI tools, learning how to sustain their project progress, and spreading QI throughout their agency. Staff from the 11 Wave 7 health departments (Bladen, Burke, Cabarrus, Carteret, Cumberland, Guilford, Haywood, Hoke, Madison, Northampton Counties and the Rhode Island Department of Health) participated in the workshop. “I enjoyed the one-on-one time with coach and staff. It was very helpful!," said one PH QI 101 participant. Teams were enthusiastic about the changes they made and eager to share ideas with other agencies. Each team created a storyboard to showcase their project, display results and discuss the lessons they learned throughout their project. Teams even created and performed songs to illustrate their QI journey. "I have been very impressed with how much progress all of the Wave 7 teams have made in a short time...the pace of change has been breathtaking," said Dr. Greg Randolph, Director of the Center for Public Health Quality. Going forward, each team will go back to their agency and work on spreading and sustaining QI. The course faculty and Center staff will continue to be a resource for each team as they start new projects over the next 6 months. Teams will also participate in quarterly calls to continue sharing ideas and learn from other agencies. Finally, teams will enroll 1-2 staff in the Center’s QI Advisor Program, to learn how to lead QI projects and Kaizen events in their agency as well as lead the spread of CQI throughout their health department.